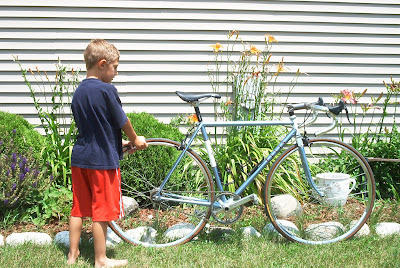 Harlan sent along these two of his Ellis single speed. That's Ben holding on to Dad's bike. Team Ellis paint scheme and the contrasting fork crown. There's news on an upcoming ride and tours of Ellis world headquarters and a special deal on jerseys and shorts. Keep 'em comin'! I hope by spring to send in my own pic. 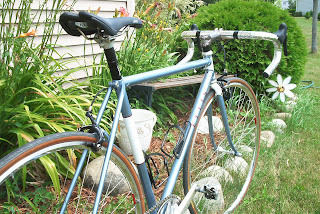 However, the traditional picture in front of the garage door, derailleur side out, crank parallel with chainstay and chain in big ring would highlight them the best!